Timber Trails is a smaller Community located just off of route 423 in Pocono Pines Pa. It is right around the corner from Lake Naomi. Even though it is one of our smaller attractions, it is still full of amenities, fun things to do all year round, and great in location to other Pocono Attractions. Its homeowner members enjoy gated security, larger parcels than its sister community Lake Naomi, a swimming pool, a 9 hole golf course, playground, tennis courts, and a sandy white beach on the 46 acre Timber Lake. Another fun perk includes the ability to join The Lake Naomi Club and enjoy even more events, activities, and amenities! 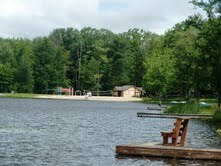 Lake Naomi is a Five Star Platinum Club Located in the tiny town of Pocono Pines PA. Enjoy Golfing at the 9 Hole Executive and Private Golf Course, and be sure to check out the Two Olympic Sized Outdoor Swimming Pools including the Largest Outdoor Heated Swimming Pool in the State of Pennsylvania.Also, enjoy the Fun Filled Activities at the 48,000 Square Foot Community Center which offers a number of Community Amenities including an Indoor Pool, Fitness Center, Indoor Tennis, and Family Filled Activities all Year Long! Lake Naomi offers The Best in Upkeep and Recreational Staff and Community Amenities. Towamensing Trails is a Private Lake Community Located in Albrightsville Pa in the Pocono Mountains of Northeastern Pennsylvania. Towamensing Trails keeps its residents privately nestled into the Beautiful Woods and Mountains of the Poconos, but it is still Great in Location for your nearby Living Essentials. This is a very Woody and Rustic Community and offers all of the Full Perks that most Amenity Filled Communities in the Poconos offers. There are also many Pocono Resorts and Pocono Attractions nearby that you can enjoy Skiing, Snowboarding, White Water Rafting, and much more. Towamensing Trails is no stranger to Pocono Amenities. This Community offers to its residents a Private Pool, Beach, Basketball & Volleyball Courts, Ball Field, and Playground. The 190 Acre Lake is Full of Fish. Private Boats are free to Sail the Beautiful Lake as long as they are not Gas Powered. Right across the way from the Pool and Lake is the Towamensing Trails Community Center. This is where many Pocono Festivities and Recreational Activities may take place such as Halloween Parties, Easter egg Hunts, Memorial and 4th of July Celebrations, Teen Activities, Flea Markets, and many other fun filled activities. Towamensing Trails of the Poconos has its very own Lounge. The Lounge is offered to Owners, Renters, and Authorized Guests. Seclusion and Privacy ABOUNDS With This 3 Bedroom, 2 Bath Cedar and Stone Faced Split Chalet! ALL Pertinent Living space is on Main Level for EASY LIVING! Property is Oversized at Just Under an Acre and Borders Greenspace to the Right and 21,000 Acres of Bradys Lake State Gamelands to the Rear Complete With Infamous TROUT CREEK Flowing Through. 3 Minute Walk Back to Stream From Property. 10 Minute Walk to Lake! TURNKEY PROPERTY in Locust Lake Village! 256 Paxinos Drive. Backs Up To Greenspace! WHAT A FIND! Home Recently Totally Remodeled! Full Finished Basement! 3 Bedrooms, 3 Full Bathrooms, Quadrafire Wood Insert in Living Room Fireplace, Large Living Spaces, Giant Kitchen / Dining Combo, Skylights for Natural Light, Sold Furnished as Per List! Approximately 1 Minute Walk to Island Pool Facility in Family Friendly Arrowhead Lake Community! This is a great home right near the amenities that bring you and your family to have a vacation here in the Poconos! Pinecrest Lake is very Secluded and Nestled in the Heart of the Pennsylvania Pocono Mountains. This Wonderful Community offers you the Premiere Vacation and Full Time Living Accommodations in a Private Estate Setting. Pinecrest Lake is located in the tiny town of Pocono Pines PA.Amenities in this Lovely Community include an 18 Hole Golf Course with a Clubhouse, a 77 Acre Lake with a Beach used for everything including Boating.Also, there are Har - Tru Tennis Courts with a Proshop, Miles of Cross Country Jogging Trails and, an outdoor Swimming Pool with Slide and Diving Boards on site. Pinecrest Lake also has Amenities for Winter Fun. Enjoy on - site Winter Activities including Snowmobiling, Skiing, and Ice Skating. The Poconos is full of fun things to do. Many things draw thousands of people here every year including Skiing, Boating, and Pocono Mountain Resorts. One of our key attractions are some of our Beautiful Pocono Communities that are scattered about all over the Mountain. Stretching throughout all of our counties including Monroe , Carbon, Pike, Wayne, and Luzerne, there are Amenity Filled Pocono Mountain Communities. All of which boast their very own unique features which makes them special, and makes them each stand out from one another. From the lakes of Lake Harmony to the Slopes at Camelback Mountain, the Pocono's Communities have a little something for everyone who visits them. Here's a list of some of our Finest Communities located in the Poconos. Feel free to click around and see which of them suits your needs best. Ski Trips To The Poconos! The Summer is beginning to come to a close here in the Poconos. Fall will be here before you know it, and right after that is prime time in the Poconos. Ski Season! 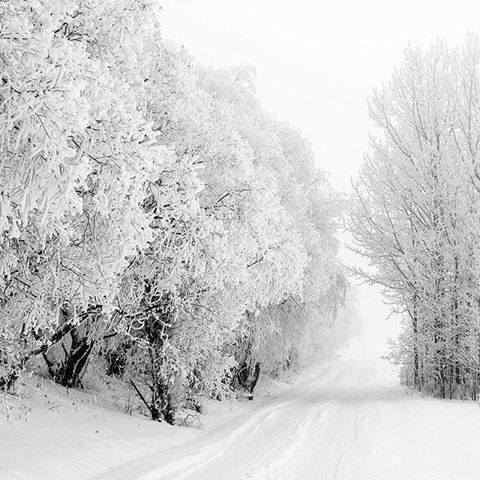 It's never too early to start planning your Winter Getaway or Family Ski Trip on the Mountain. The Pocono Mountains is full of fun Ski Resorts. Last year the snow came in October giving us an early start on the slopes! Take a look at two of our most popular Ski Resorts here in the Poconos! Big Boulder Resort - 50% of Big Boulder overall Terrain to Park Features. The Base Elevation is 1,700 Feet with a Summit Elevation of 2,175 Feet, and a Vertical Drop of 475 Feet. Big Boulder Proudly Boasts the most Progressive and Innovative Terrain Park Program. At Big Boulder, there are 15 Different Slopes, and they are Arranged so that even if you aren't the Sharpest Skiier, you can still enjoy the Slopes and winter Time Fun at Big Boulder. The Best Skiing, Snowboarding, Snow Tubing, and Terrain Parks in the Pocono Mountains can only be found at Big Boulder, and they are the Ideal Destination for your Perfect Winter Retreat to the Scenic Pocono Mountains. Jack Frost Mountain - provides an Inviting Ski Area with a Summit Elevation of 2000 feet, Base Elevation of 1400 feet and Vertical drop of 600 feet. 21 different slopes to include: Ski School Learning Slope, 4 Easiest (beginner slopes, 6 More Difficult (intermediate slopes), 8 Most Difficult (advanced slopes) and 2 Terrain Parks. There are 9 lifts: 1 quad, 2 triples, 6 doubles and 1 ski carpet (used for kids lessons only). Penn Forest Streams is a Heavily Wooded Private Community Located just off of Route 903 in the Beautiful Pocono Mountains. This Cozy Community is Comprised of 710 Home Sites within Five Different Sections having 14 miles of moedern roadways. It is just 7 Miles North of the County Seat of Carbon County, Jim Thorpe, Pa. Penn Forest Streams is Very Scenic and Private. These secluded Homes are Nestled into the Beautiful Never Ending Woods of the Pocono Mountains. But being Nestled in the Woods doesn't exclude Penn Forest Streams from the Landmarks and Establishments that make the Poconos so exciting! Penn Forest is not far from Pocono Raceway, Penns Peak, Fine Dining, Shopping, and much more! Penn Forest Streams is also close to Whitewater Rafting, Skiing, Hiking, Camping, Hunting, Biking, and Paintballing! The Community Amenities Include 2 Pools, Security Services, a Clubhouse, Pavillion, Tennis Courts, and Basketball Courts. Penn Forest Streams offers Pocono Mountain Festivities including family friendly events such as Community Sponsered BBQs and other social events. With the Average Lot size being around One Acre, it allows for your home to Nestle even further into the woods for that 'Forest' Like Setting. This Community is not Gated and does allow Four Wheelers and Golf Carts. 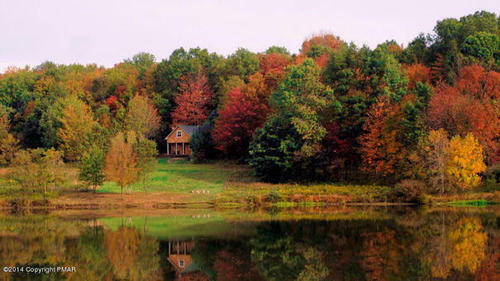 Penn Forest Streams offers Homeowners Peace and Tranquility that comes with Pocono Mountain Living at its Very Best! Towamensing Trails - is a Private Lake Community Located in Albrightsville Pa in the Pocono Mountains of Northeastern Pennsylvania.This is a very Woody and Rustic Community and offers all of the Full Perks that most Amenity Filled Communities in the Poconos offers including a 190 Acre Lake, Boating, Fishing, a Pool, Holday Celebrations such as New Years and 4th of July, and there is also a a Lounge inside the Community. Pocono Mountain Lakes - If you're looking to just get away and get lost in the nature of the Pocono Mountains, Pocono Mountain Lakes would be the community for you. This is a small, cozy, and tucked away community right off of The Pa Turnpike. It is tucked away and very off the radar and boasts some beautiful homes. The lake is a modest but refreshing 6 acres. 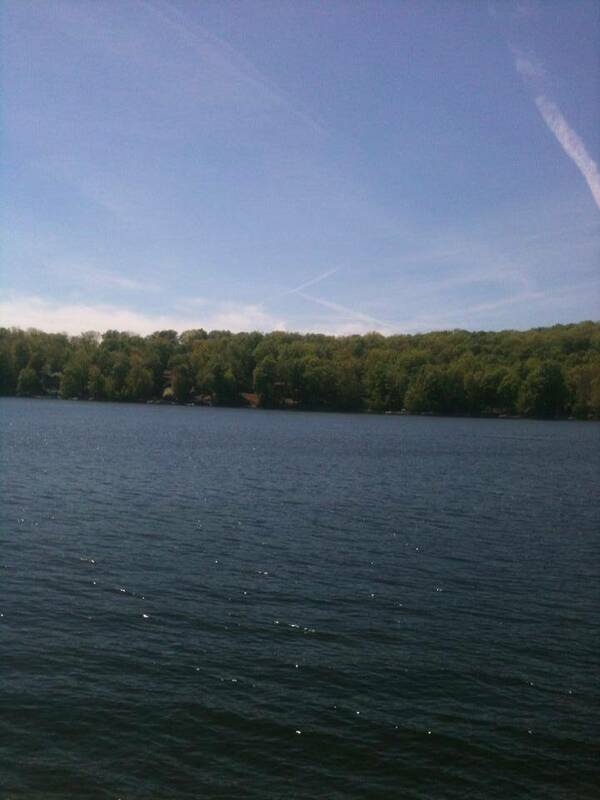 Bear Creek Lake - This community is located just off of Route 903 as your heading towards Jim Thorpe. It is great in location to all of the fun the Pocono Mountains has to offer being minutes away from Skiing, Whitewater Rafting, Fishing, Golf, and many more Resorts and Attractions. 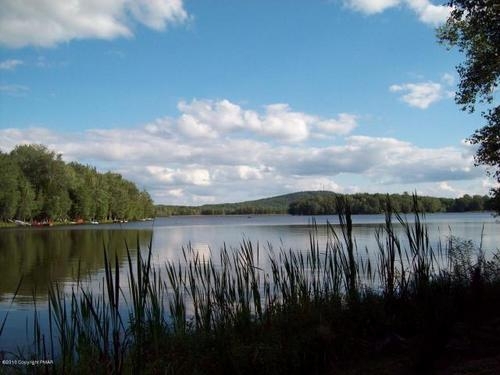 This 4 season Pocono Community offers primary homeowners and renters tons of amenities and fun things to do including a 160 Acre Lake which has fishing, boating, and swimming along with a beach. There is also a heated outdoor swimming pool, basketball, softball, and volleyball courts. CLICK HERE to see many more of Carbon County's BEST Private Communities in the Pocono Mountains. Fall Time in Northeastern Pennsylvania is a truly glorious time of year. Of course, the Poconos is a 4 season type of region offering many different varieties of family fun and fantastic views, but there is something about Fall Foliage in the Poconos that really brings out the best of the entire region. Every Pocono Town is completely surrounded by acres and acres of Trees, Forest like settings, Pa Gamelands, and the purest beauty mother nature has to offer. The leaves of these trees are changing into an almost rainbow variety of different colors, and they're falling all over the place like a Leaf Blizzard. The black bears of the Poconos are always on their way into hybernation during this time of year, but I've still seen a few in my past Autumn Seasons in the Poconos. Whether it be a horseback ride, a train ride through the region, a haunted hayride, or a simple hike or mountain bike ride with your camera ready to snap, the Pocono Mountains during Fall Foliage is the place you truly want to be. 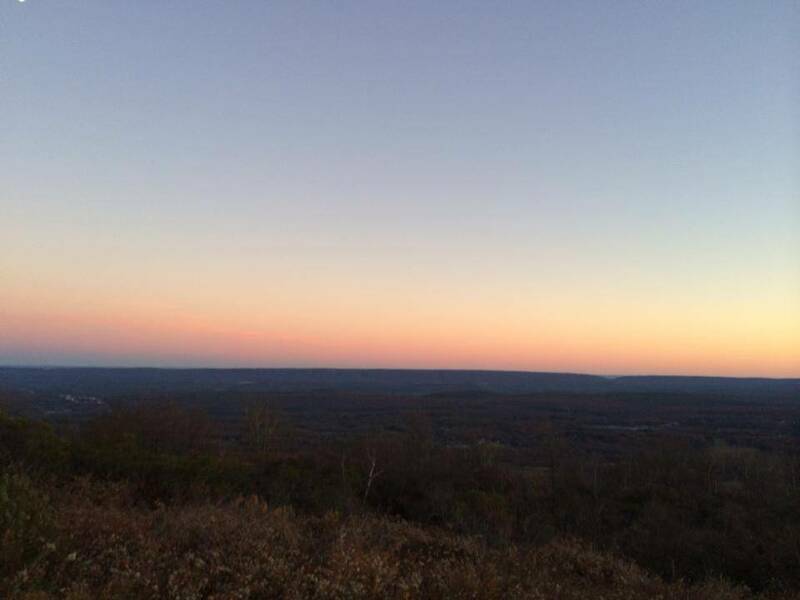 There are many many scenic driving routes throughout the Poconos. Perfect season and Perfect region for a nice long drive of beauty. There are craft festivals, beer festivals, pumpkin patches, haunted houses, hot air balloons, and most of all a fantastic peak of Fall Foliage Beauty throughout the Pocono Mountains. Come join us in the Poconos this Fall Season, and see for yourself! The most popular Home Setting of Choice is the Lakefront Home. 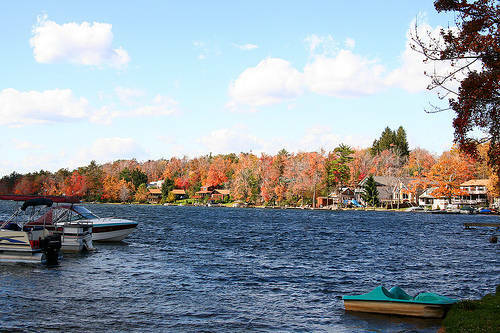 Lakefront housing in the Poconos has steadily been the most popular purchase of any home in the Pocono Mountains! Bodies of Water flow throughout the entire Mountain Region. The Lehigh River flows through Amenity Filled Communities such as Bear Creek Lake and Riverside Estates, The Delaware River flows through The Stroudsburg and Deleware Water Gap area, and there are so many Lakes, Streams, Creeks, and even waterfalls in some areas! 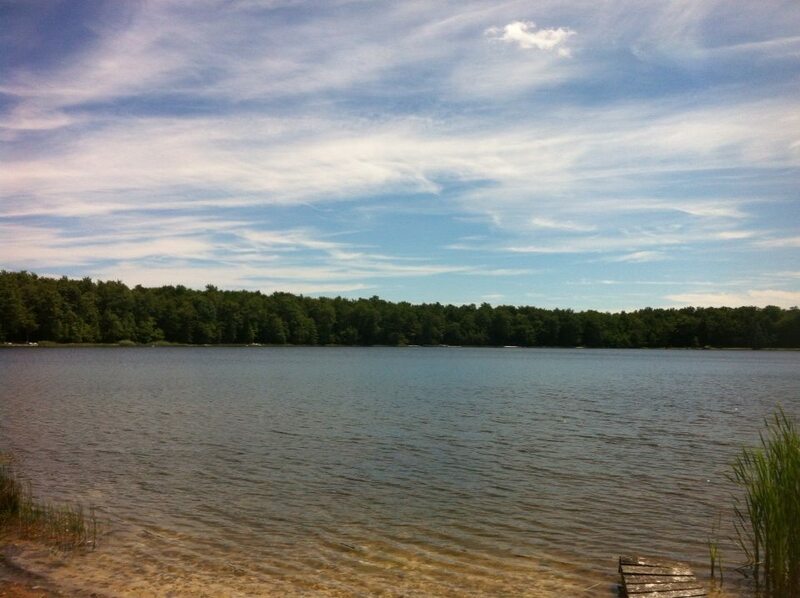 Everywhere you look in the Poconos, you are bound to see a lovely lake of some sort. Lakefront Housing gives you the chance to have a lake right in your backyard. The Poconos is very well known for it's wildlife. Everyone in the Poconos has seen a whitetail deer or black bear at some point in their Pocono experience. The Pa Gamelands are another niche to Pocono Homes with some homes backing right up to Gamelands. You can't drive anywhere through the Beautiful Pocono Mountains without stumbling upon a Breath Taking Mountainside, View of Never Ending Mountains, or a Lake full of Fish. PA State Gamelands are all over the Poconos making Our Area a Hunters Paradise! A Great Pocono Mountain Home Purchase is that Elusive Gameland Bordering Property. 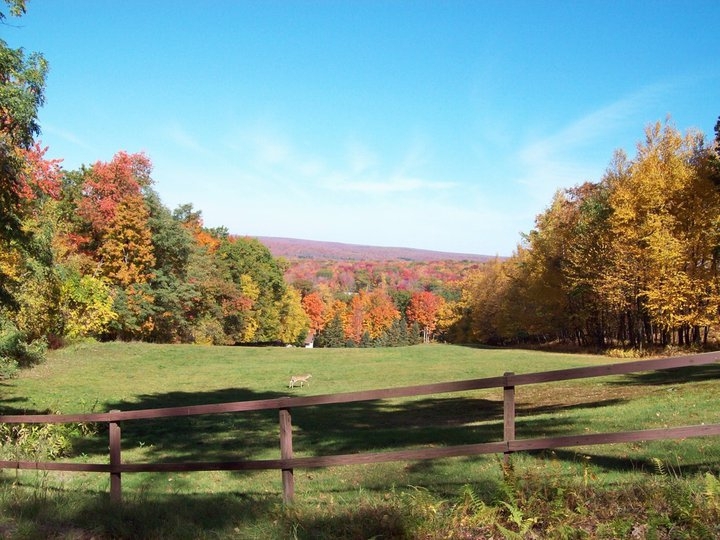 The entire Pocono Mountain Region includes a vast range of different Pa Gamelands or Pa State Forests, some of which have homes bordering them or backing right up to them. Even many of the Perfect Pocono Mountain Communities themselves back right up to Gamelands. September in the Poconos is when the leaves start changing, the weather starts changing, and all the Poconoans start cleaning out their fire places. Fall is beautiful in the Poconos because of its landscapes of never ending mountains with the leaves changing more and more everyday. Cool Pocono air and a good fire going is perfection that can not be matched. Poconoans start stocking up on their firewood preparing for the long awaited change of weather and scenery after a long hot Summer. There are hundreds of Homes For Sale in the Poconos today! The Communities and towns in the Poconos will also start holding all of their Fall Foliage Events. Jim Thorpe, Stroudsburg, Arrowhead Lakes, Split Rock Resort, and many others have festivals and other fun events to make Fall a special time before winter moves in. 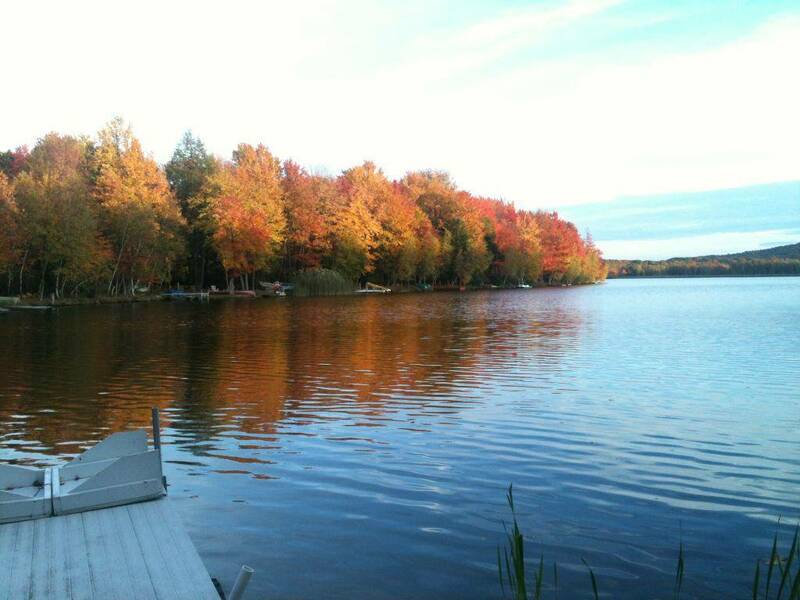 Take a look at some of the photos of Fall In The Poconos! 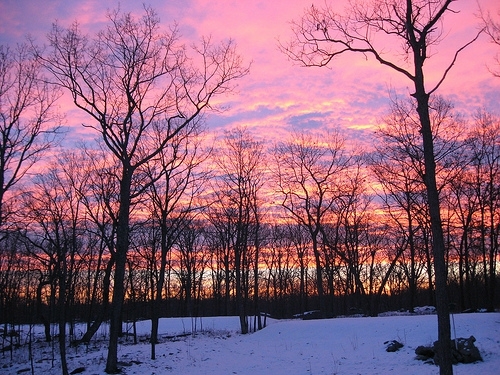 Beautiful Photos Of The Poconos! This is a lakeside view of one of the most popular communities in the Pocono Mountain RegionArrowhead Lakes!